KillerRONS.COM is proud to be a stocking dealer for Transmission Specialties, Inc. This company has been in business over 30 years and is one of the leading manufacturers of high performance racing transmissions, torque converters and related parts in the world. Leading racers and top-of-the-line transmission and converter builders count on this company for their parts, services and experience. Transmission Specialties is famous for the development and patent of the "spragless" racing converter over twenty years ago. This is the design that most converter companies are emulating today. Transmission Specialties has continued to "set the curve" in the last decade with the Pro-Line Series of transmissions and the guaranteed "unbreakable" 1.80 gear sets. Most every part that Transmission Specialties sells to customers and builders is manufactured in-house at the Aston, PA facility. KillerRONS.COM's James Monroe has been affiliated with Transmission Specialties for the last six seasons. It is no coincidence that James' great success on the track in those years is due, in part, to this companies "spragless" racing converter. WHY A “SPRAGLESS” RACING CONVERTER? Originally written and published in National Dragster Magazine by Transmission Specialties, Inc. Supplemented by James Monroe is red text. The converter sprag assembly is often damaged during the initial tire shake as the racer goes through the burnout. This sometimes can happen on the VERY FIRST burnout. The spring is rapidly loaded and unloaded during tire shake, causing the sprag to wear unevenly and eventually break. This happened to me and my last sprag converter in July of 2005. In the first round of a local big-money race I was completing my burnout and after the tires dried up I noticed the idle was being drug way down. Having ran injection for many years; I knew that the fuel pump, injectors, filter, nozzle jets were not the cuplrit of this. So, I staged the car and hoped for the best. When the RPM's came up on the starting line sure enough 3400 was as high as it would go. Long story short, the sprag had failed in the burnout. The very next day I ordered my first "spragless" converter from TSI based upon exceptional feedback I had received from customers on the East coast. A worn sprag is actually worse than a broken sprag as the racer has no idea why the vehicle is so inconsistent and will spend countless hours checking everything but the converter. You probably thought that the above decision to go to a "spragless" converter was hasty. What you don't know was what led up to that in the previous years. In 2002, I was lucky enough to be able to travel the country and do what many of us dream of doing which is to chase the big-money circuit. I had a relatively successful season winning my share but went through no less than 7 converters in that season. At the time I was using a popular 9" sprag converter and making 35-40 good runs before the car would slow down .03 to .05 and become very inconsistent. Again, knowing injection doesn't do this I went straight to the converter each time. Low and behold, every time I stuck a new one in the ET would come back both in performance and consistency. Each time I was told by the manufacturer that they could find nothing wrong with the converter and that I should put it back in the trailer as my spare. I had accumulated four converters by the end of that season. When the sprag eventually breaks (below), a racer will see the car slow down about .3-.5 seconds and the inexperienced and sometimes even experienced racer will spend hundreds of dollars chasing fuel and electronic system fixes. My experience with customers has been that AFTER I talk them out of the fuel pump going bad or the injectors and nozzle jets being clogged they will spend hundreds of dollars on new ignitions, spark plugs, spark plug wires, crank trigger pick-ups, etc. Eventually, after weeks of misery they will finally jerk the converter out and send it in. The "classier" converter companies will admit what happened and others will not (for whatever reason) and then recommend their new "spragless" design. Following is some information to help you troubleshoot a possible sprag slipping or complete failure. If the sprag slipping occurs on the starting line, which is prevalent with use of the trans brake, the converter will “load” the engine just for a moment (i.e. a couple of hundredths) and the car will roll through the stage beam at an RPM less than normal stall speed. The result of this is vehicle reaction time loss. Your .010 light is now a .040 light. If the sprag slips more than a few moments, the 60 ft. time will also suffer. Sound familiar? My reactions times and 60' were more consistent after the installation of my Super 8 "Spragless" converter, without question. If the sprag in the stator of the converter slips on the shift change, the RPM's will fall back to something lower than the normal stall speed of the converter. For example, the RPM after a shift change will be 200-300 lower if the sprag is slipping. This will slow the elapsed time .02-.03, plus a loss of MPH. I see something a little more dramatic with the extra fuel sent through an injected engine in my customer's cars. This extra fuel not being burned when the "load" of the slipping sprag is happening causes an approximate .2 loss in ET. The racer complains of the car launching and running great through the 60' and then somewhere between the 60' and the shift point the car will fall on it's face. Then the car will pick up in high gear and take off like a champ. Same scenario as above, the customer is eventually convinced after many hours of conversations and many weeks of frustration to send the damaged converter back for repair. The "spragless" converter was under patent protection from 1986-2003, many converter manufacturers claimed that a "spragless" converter would slow the race car down and cause excessive heat, in an attempt to market their sprag type converter. I have not found this to be the case in any way with the enhanced bottom-end torque of a methanol burning engine! 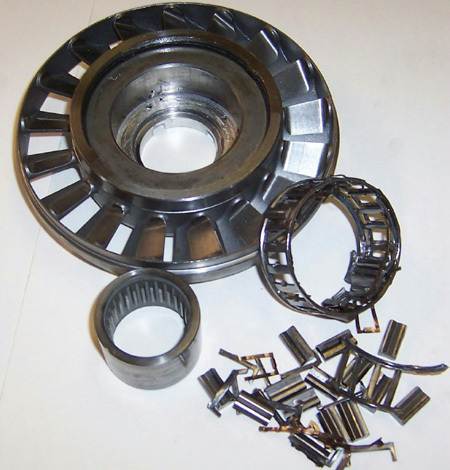 The above marketing ploy was understandable as patent law prevented the manufacture of a "spragless" racing converter by anyone other than Transmission Specialties from 1986 to 2003. Since the expiration of that patent seven years ago virtually all of the converter manufacturers offer the "spragless" converter in their product lines. I have always believed that the converter is the weakest link in the high HP bracket car. Since my change the "spragless" I have only had one instance of converter issues on some pretty high-powered or highly competitive bracket cars. One tightened bearing slowed a car several hundedths in 2007 and this was diagnosed and rectified in one weekend. For the KillerRONS.COM customer there are two basic forms of this popular converter that would be tailored to your specific combination. The most popular is the the #802 SPRAGLESS 8" RACING CONVERTER. There are over 7,500 of these converters racing today. Of course, there is no sprag to slip or fail which makes these converters offer the ultimate in consistency. Stall speeds are available from 4000-7000 RPM and can be configured for engines from 327 to 500ish cubic inches (400-850 HP). Of course, your are welcome to one free stall speed adjustment within 90 days of purchase or the within 90 days of the beginning of the race season.The price of this converter is $880 and it is available with a steel stator for an additional $80. Note: You can have other brands converters changed to the "spragless" design for $450. *Bolt together versions of these converters are available for an extra $250-$300. Next in line is the #813 SPRAGLESS "SUPER 8" 9" RACING CONVERTER. This is the perfect converter for 509 to 632 cubic inch engines with 850-1250 HP. This is the most efficient 9" converter on the market for higher horsepower bracket engines and works extremely well in today's fastest bracket cars. As with all Transmissin Specialties converters you are welcome to a free stall adjustment within 90 days of first use. This converter sells for $1,050 with an aluminum stator but it is recommended in methanol burning 1000+ HP engines to upgrade to a steel stator for an additional $100. Note: You can have other brands converters changed to the "spragless" design for $450. *Bolt together versins of these converters are available for an extra $250-$300. The "UNBREAKABLE" Gear Set from Transmission Specialties is also available at KillerRONS.COM. The straight cut 1.80 gear set (9310 material) and 33M output shaft comes with a one-year warranty and is recommended up to 2000 HP. Your KillerRONS.COM price is $995. If that is a little out of your budget or power-level requirements you can get the same 1.80 gear set with a 4340 output shaft for $825. Specify whether you need a long or short set when ordering. 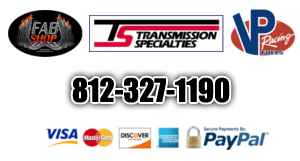 Due to the fact that most are not lucky enough to have local high-performance transmission builders locally Transmission Specialties offers the Pro-Line series of transmissions. The most popular at KillerRONS.COM being the Pro-Line 5000 unit. Selling for $3,995 this transmission is rated for use up to 2000 HP and is available in a long or shorty style aftermarket case (SFI approved) and is outfitted with a NASA input shaft, 8 clutch pack, 4340 output shaft, 1.80 guaranteed unbreakable gears and deep pan. What do you need to do to get one of these converters or transmissions? Call or email James Monroe at 812-327-1190 or email info@killerrons.com. He will take your information and consult with the specialist at TSI to select the proper unit for you and offer competitive pricing including shipping that is often under $150 within the continental states. If you elect to speak with Transmission Specialties directly you will want to speak with Ken Kelly as he deals directly with KillerRONS.COM customers. You can also find Monroe at the races every weekend as transmissions and converters are in the trailer for customers, if needed. Look for the TSI awning near you.